Have I mentioned lately how brilliant my little reading group happens to be? Or how much I enjoy our morning lessons? It is such a pleasure to learn along with these students! 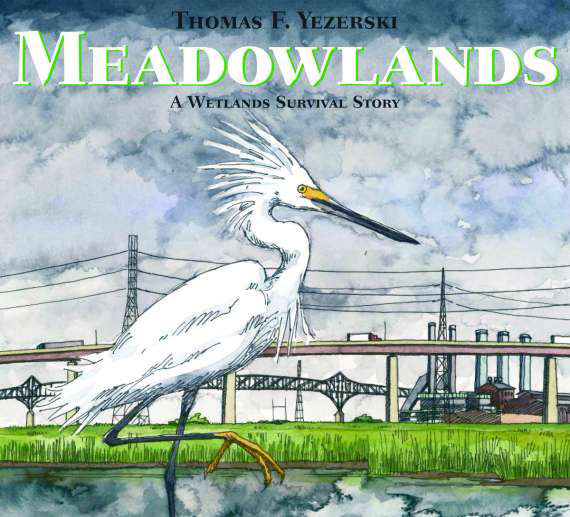 We have been working on strategies to use when we come across an unknown word or concept using the wonderful story by Thomas F Yezerski: Meadowlands – A Wetlands Survival Story. This book takes us back in time hundreds of years to when the Meadowlands were 20,000 acres of swamps, marshes and bogs and home to many different plants and animals. Over time human interactions had a very detrimental effect on this wetland habitat. Much of the wildlife fled or disappeared. Pollution and gargbage threatened to destroy the area completely. In the 1960s only 11,000 acres of wetlands survived in the Meadowlands. However, many things worked in the favour of this ecosystem: the daily meeting of the river and tide, laws that alterted chemical dumping, reintroduction of different insect, fish and bird species as the habitat improved, etc. In 2007, a young osprey was spotted taking flight from a nest built in the Meadowlands. This young bird of prey was a symbol of recovery and hope for this precious ecosystem. As we read the text and came across a word we didn’t know, we collectively tried to figure it out and charted our thinking. We filled an entire chart paper with strategies! The Meadowlands is an estuary where the Hackensack River empties into Newark Bay. Much of it is wetlands, with a mix of freshwater and salt water soaking the spongy ground. We didn’t know what estuary meant. We needed to use some of the strategies listed below to determine what the word meant (especially reading on to the next sentence, inferring and referring to a reference page that included a map) We figured out that it probably meant a boggy, wet area where the fresh water mixed with the ocean water and that maybe it would support unique ecosystems. What do you do when you come to an unknown word? *does the word sound like another word? have a root that we recognize? *think about whether you are understanding. This is worth it even if it might be slow going and very tiring! So I did mention the brilliant aspect of these kids right? What was wonderful was that as we read, we found there were fewer unknown words or confusing concepts because we were gaining a deeper understanding of the subject matter. Now we can engage in this active engaged reading independently with various non-fiction texts. But, we continue to practice with a weekly book we can share together. This entry was posted in Classroom Views and tagged ecology, great read alouds, information story books, nature, picture books, Thomas F. Yezerski, wetlands by carriegelson. Bookmark the permalink.